Recommended to: Readers who like stories that blend mystery with the darker side of being a teen. The parts of Mira Cillo that Ben touched are etched on his soul. Palm. Hair. Chest. Cheek. Lips. Throat. Heart. It was the last one that broke her. After her death, Mira sends Ben on a quest for notes she left in the seven places where they touched—notes that explain why she and her sister, Francesca, drowned themselves in the quarry. How Ben interprets those notes has everything to do with the way he was touched by a bad coach years before. But the truth behind the girls’ suicides is far more complicated, involving a dangerous infatuation, a deadly miracle, and a crushing lie. So, first off, kudos to the designer of this cover because it's a thing of beauty. My heart belonged to this book before I even gazed eyes upon the synopsis. Still, it was ultimately the synopsis that did me in. I love stories that hint at a mystery beyond death. The idea of someone leaving you notes to discover the reason behind their demise has always fascinated me and, quite honestly, is one of the YA concepts that I'll read no matter what. 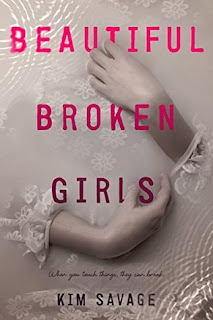 It's not hard to imagine that I was pretty excited to dive in to Beautiful Broken Girls. I only hoped that it would live up to the hype that my brain was already generating for it. Which is where we come to the difficult part, and that's the fact that I'm still not sure entirely how I feel about this book. I'm a bit on the fence because, well, this story confused me more than I'd like to admit. Beautiful Broken Girls starts out fairly strong. We're introduced to Ben as he's mourning the loss of Mira who, as we slowly uncover, was a much bigger part of his life than he'd like to admit. I liked Ben. He was a little broken, a little angry, but full of the kind of resolve that only exists when you truly cared about someone. His quest to find out what happened to Mira was harsh at the best of times, but he soldiered on despite all of that. Ben's relationships with the other characters in this story, specifically his family and his group of guy friends, were also pretty well laid out. I understood his frustration that people kept trying to put him in a bubble because of his past trauma. I felt for him that he couldn't express his feelings, because it looked to the outside world that he was overreacting. While I wasn't a huge fan of the majority of the other boys in this story, I liked that they weren't caricatures of what someone believes boys would be. They were raw, and honest, and sometimes kind of obnoxious. Just like real life. The disconnect for me, came when Mira and Francesca's story began to unfold. I'm not entirely sure what I was expecting the reasoning behind their suicide to be, but the choppy and vague story that was laid out for me left me feeling a bit frustrated. I don't want to give anything away, for readers out there who are interested in this book, but I can confidently say that I wanted much more backstory. It drives me mad when characters are given a special trait, or an interesting existence, and there is absolutely no explanation as to where it stemmed from. Since I had no insight into Francesca's past, she simply felt shallow and spoiled to me. I had no empathy for her whatsoever. Which meant, unfortunately, that since Mira kept playing into her delusions I kind of began to hate her as well. As it stands, Ben ended up being the best part of this story. The ending was okay, although not quite what I was hoping for. I just really feel like the middle of this book needed much more explanation and much less of Ben's flashbacks. It was tough for me to build a relationship with any of the other characters, and it ended up hurting my connection with book. Did I mention that my feelings are all over the place? I can definitely offer this book a three star rating, and say that there's much of it that is going to interest other readers out there. If you're looking for a book that blends mystery with some darker emotions, you'll want to pick this up.